'Top Tots and Top Start'. "Children involved in regular exercise earn better grades and have better social skills than those who are not." (American Pschological Assocaiation, 1996). The Top Tots and Top Start exercise programmes are intended specifically for young children. Top Tots is for children 18 months - 3 years uses physical activity to develop communication and language techniques, co-ordination and co-operation and social skills, through physical activity and play. Top start for the 3 - 5 year olds is focused on developing basic movement and ball skills. 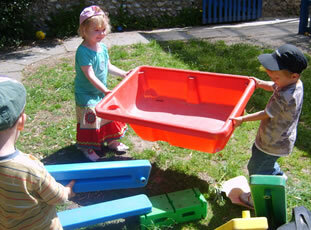 It is designed to encourage the full integration of all children. It is delivered through a number of organised games concentrating on the following areas: Basic Motor Skills, Spatial Awareness, Co-ordination and control and Aiming, Predicting and Estimating. The meals are wholesome, nutritious and balanced. Meals are freshly prepared each day. Processed food is not served and children are not given food and drinks with high levels of artificial additives and sugar. Drinking water is always available and encouraged. Mealtimes are relaxed, social occasions when children and adults sit together around the table to enjoy their food and each other's company. We help the children to enjoy trying different foods as well as their favourites and to understand why some food is healthy and why others are not. Stories and other activities about healthy foods are enjoyed by the children. Menus are displayed for your information and if your child has special dietary needs please feel free to discuss this with Nicole. The children are also taught that sometimes it is important to know when it is time for them to have a little rest and to be calm. To be able to decide this for themselves is a valuable resource not only as a child but as an adult, it is not only useful in making and retaining friends but for maintaining physical and mental health.